Born in 1759, inheriting the vast Noel estates in 1798 from an unmarried uncle and taking the Noel family surname, he was among the richest men in England, but when he died in 1838 he left poverty and embarrassment to his successors. His first wife, Diana Middleton, bore him 18 children and then found out that he had a mistress. She was Harriet Gill, the daughter of the Rev. Joseph Gill, Vicar of Exton in Rutland where the Noels had their main seat. Diana and Gerard separated and she went to live on the Gower Peninsula in Wales, where she devoted herself to philanthropic works and Methodism. Three weeks after Diana’s death in 1823 Harriet became his second wife. When she died, only three years later, he took a third wife, Isabella Evans, who described herself as “a widow”, but who, in fact, had never been married. In nearly 70 years, he spent all his money; he was generous and kind hearted, adored by his tenants, but also unpredictable, erratic and extravagantly profligate to the point of irresponsibility. He involved himself in various grand schemes – building a military riding school in Oakham, an hotel in Stamford and starting a new house at Exton, founding a new London bank and involved in various canal schemes. He was for fifty years an MP and owned estates in Kent, Leicestershire, Lincolnshire, Rutland and Chipping Campden. As the largest landowner in the Campden area he was also one of the main instigators of the Land Inclosure Act of 1799 and Award of 1800. Find out more about Campden’s inclosure. 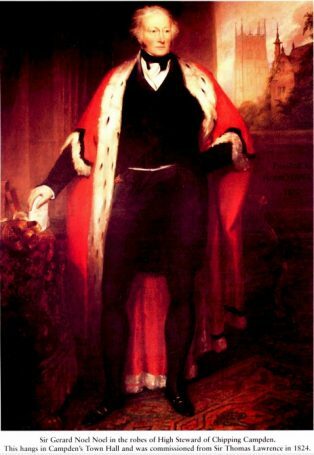 Sir Gerard’s portrait by Sir Thomas Lawrence hangs in Chipping Campden Town Hall and his family connections and legacy are seen all through the town – the ruins of Old Campden House, the Market Hall, the old school, the Almshouses, Church monuments, the Hicks and Noel Coats of Arms. Sir Gerard grew increasingly eccentric and belligerent, taking offence at the slightest thing. He died at Exton in February 1838 aged 79 leaving the Noel land and fortune in disarray. To find out more about Sir Gerard Noel, his ancestors and descendants in Chipping Campden and Exton, buy the book written by his great-great-great grandson, also called Gerard Noel. The book introduces us to the Noels who came to England with the Norman Conquest and brings us up to the 21st century. Gerard guides us through the maze of Baptists, Charles, Gerards – and Annes – Earls of Gainsborough and Viscounts Campden of the first and second creations.